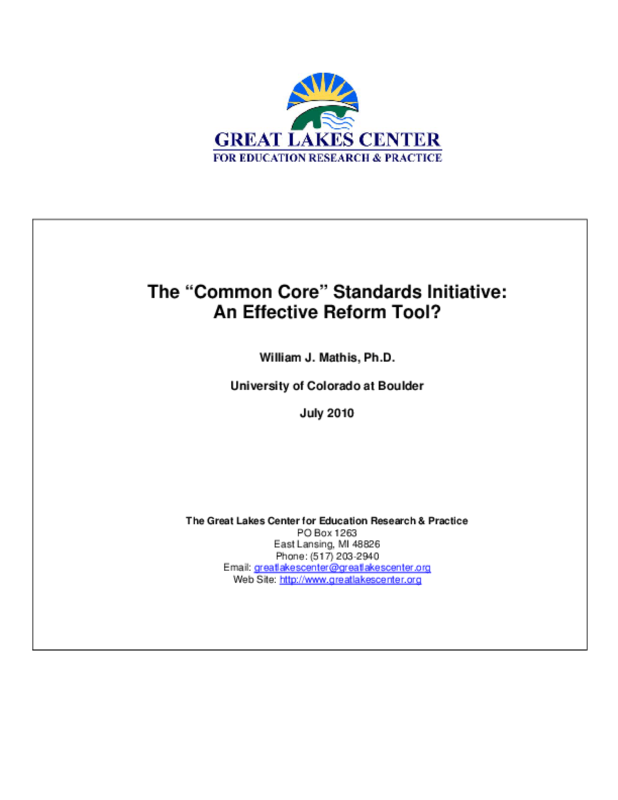 Common Core Standards Initiative: An Effective Reform Tool?, The? Very little evidence supports the contention that establishing national academic standards for K-12 schools will improve the quality of American public education, and the standards push may distract attention from other vital school reforms, concludes a new policy brief, The "Common Core" Standards Initiative: An Effective Reform Tool? The brief, authored by William J. Mathis, was released today by the Great Lakes Center for Education Research and Practice. "Without addressing both the in-school and out-of-school influences on test scores, common core standards are not likely to improve the quality and equity of America's public schools," Mathis explains. The Obama administration has embraced "common core" standards and has pressured states to adopt them by stating that federal Title I aid will be withheld from states that do not adopt standards such as those being developed by the National Governors Association and the Council of Chief State School Officers. In addition, states that adopt the standards have a major advantage on their Race to the Top applications. Standards advocates argue that common standards are necessary for keeping the nation competitive in a global economy. But Mathis points out that research does not support this oft-expressed rationale. No studies support a true causal relationship between national standards and economic competitiveness, and at the most superficial level we know that nations with centralized standards generally tend to perform no better (or worse) on international tests than those without. Further, research shows that national economic competitiveness is influenced far more by economic decisions than by test scores. Mathis also raises questions about the rapid development of the common-core standards, the lack of field testing, and the overarching need for any high-stakes consequences to be "valid," pursuant to established professional guidelines. Given these concerns, he says that the prospect of positive effects on educational quality or equality "seems improbable." Title: Common Core Standards Initiative: An Effective Reform Tool?, The?